Celebratie Inspire Your Heart With Art Day by exploring art and artists and doing hands-on art activities with kids. I will be the first to say that my daughter is not known for spending her quality time with her art supplies. However, she loves special and obscure holidays. She was excited to learn that January 31 is Inspire Your Heart With Art day. In school, Smarty gets to do guided projects during “Friday Art” and once a month through parent-volunteer program called Art Vista. At home, we give her free reign when it comes to art. She was on “make-a-creature” kick lately, and added to her growing collection of fantastic animals when drawing on Saturday. Her current approach to art made me think with amusement about our preschool days when I tried to make her into someone she is not and “guide” her to “prettier” art projects. It’s always such a pull and push between guided learning and unguided process art. Both have their place as our children discover both their inner artist and learn about great artists of the world. My current take that if the time is limited, self-motivated art exploration should take precedence over guided art. Still, guided art can look amazing and teach our kids quite a bit! 2. Paint like Picasso – from Rubber Boots and Elf Shoes. Combine math and art with Fibonacci Art Project from What Do We Do All Day? Do you do guided art projects with your kids or are they exploring art primarily on their own? I try to look at my goal for the specific activity. If it's to teach a skill they have to use the skill, but do not have to do the exact activity. If it's just to have fun with art, than go for it. I like your lantern! We should try this - we have those little electric tea lights. Okay, my previous comment goes to a different post. Sorry about that! 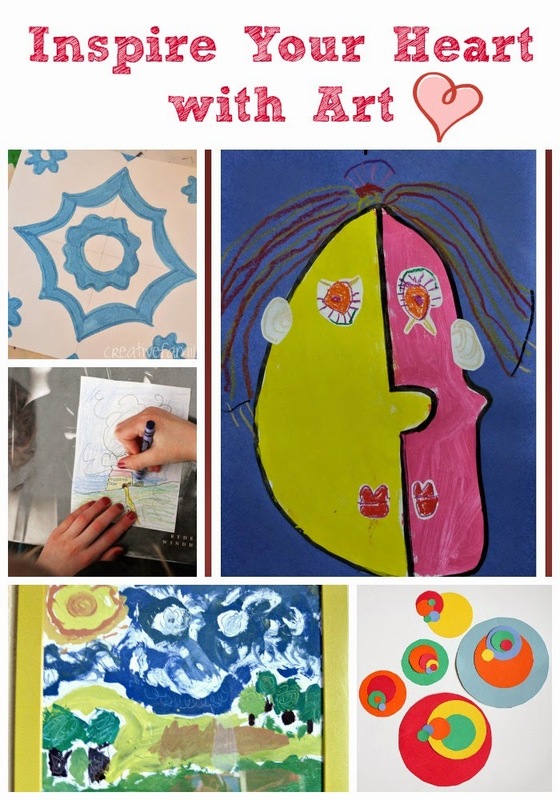 I love all of these art activities!